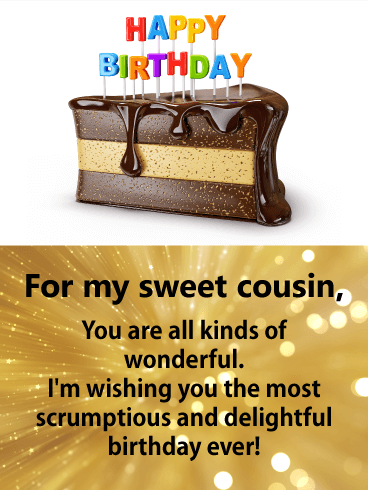 Wish a scrumptious birthday to your sweet cousin today! This birthday cake card is dripping with goodness (and not just the chocolatey kind!). 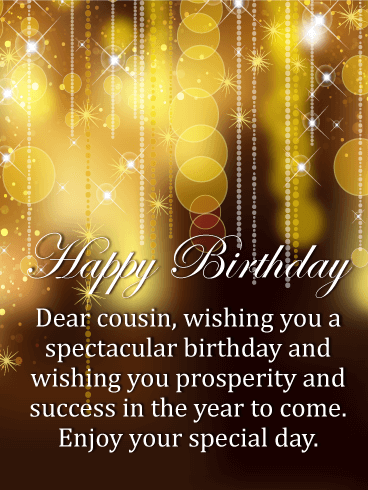 May this birthday and year be the most delightful one yet for your dear cousin. 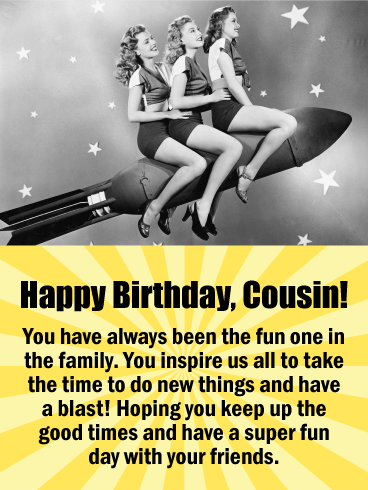 It only takes a moment to send a fun and thoughtful greeting card to remind your cousin just how wonderful they are! Glittery gold confetti brings a bright, sparkling touch to this birthday card for an amazing cousin! Put them in the mood for a "fun-filled and fabulous celebration" by sending a festive greeting to let them know you remembered them and that you're wishing them another spectacular year ahead! Birthdays are not just about the presents, sweet treats such as this strawberry milkshake can easily take center stage on your cousin's special day! Who can resist a delicious dessert like this, especially when it is topped off with a cherry! Your cousin is going to love this fun birthday card because it will remind them of all the birthday sweets they will be receiving! 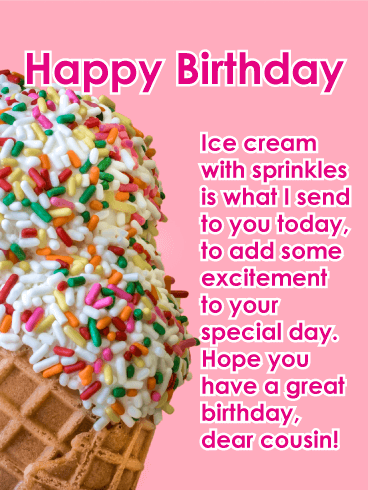 So send this yummy birthday card over to your cousin so he or she can enjoy it before it melts! If you had to imagine the best birthday desserts ever, it would certainly be these terrific milkshakes, and your cousin will just love them! This birthday card showcases these special milkshakes that are sweetly decorated with whip cream, strawberries, chocolates, sprinkles, gummy bears, and other irresistible candy items. 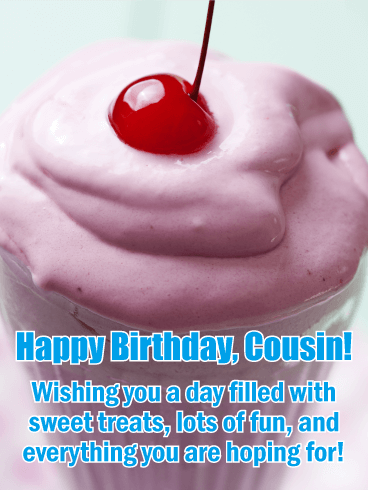 Wish your cousin a birthday that is as sweet as he or she is by sending them this delicious birthday card today! Your cousin will be very excited that you did. 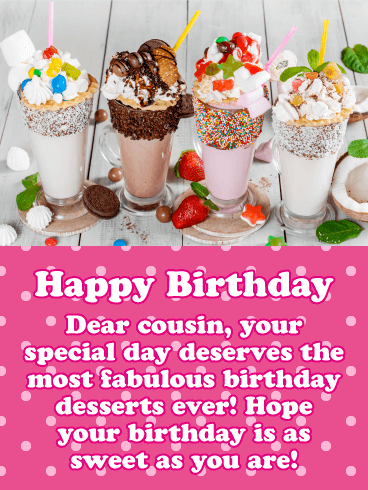 If you want to add excitement to your cousin's special day, send this perfect ice cream birthday card their way! It features a delicious ice cream cone filled with vanilla ice cream and rainbow colored sprinkles. So irresistible! Everyone loves ice cream, so get this birthday card to your cousin before someone else eats this delicious birthday ice cream cone! This exquisite birthday card displays a colorful watercolor painting of a floral arrangement that your cousin will enjoy receiving! You can't go wrong with sending flowers on someone's birthday! 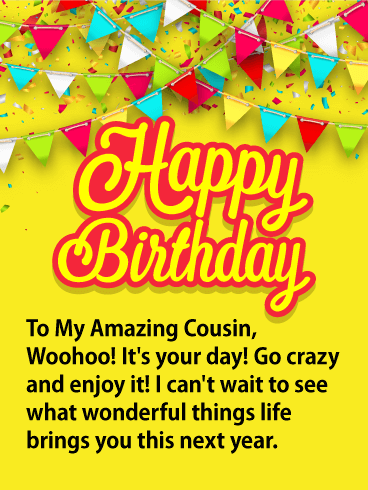 The birthday message will remind your cousin to enjoy his or her day because it only comes around once a year. Let your cousin know how very special they are by sending this pretty floral birthday card over to them. Your cousin will appreciate your thoughtfulness. Sensational and colorful, this floral birthday card will grab your cousin's attention the moment it is viewed. It features vibrantly colored decorative flower shapes that give this amazing birthday card a festive and artistic look. The black banner with the lovely center shape showcases the words, "Happy Birthday Cousin". It's so beautiful that your cousin will want to show everyone. Send these pretty flower shapes on their way to brighten up your cousin's big day! Puppies represent all that is fun! They spend hours playing and don't have a care in the world. 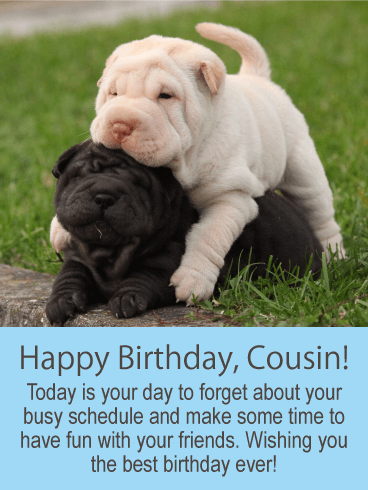 If this is what you wish for your cousin on his or her birthday, then get these fun loving puppies over to your cousin on this very special day! 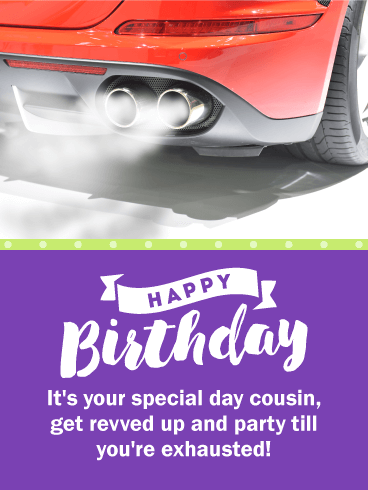 This birthday card will remind your cousin to just forget about their busy schedule so they can make time to have some birthday fun with their friends. 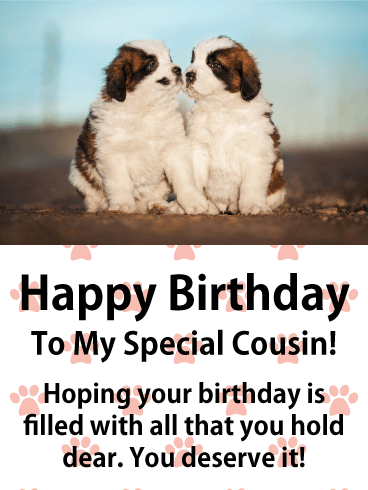 If you send this adorable puppy birthday card to your cousin on his or her special day, you can be sure it will make them smile. This cute birthday card features two puppies giving each other a little kiss. So sweet! 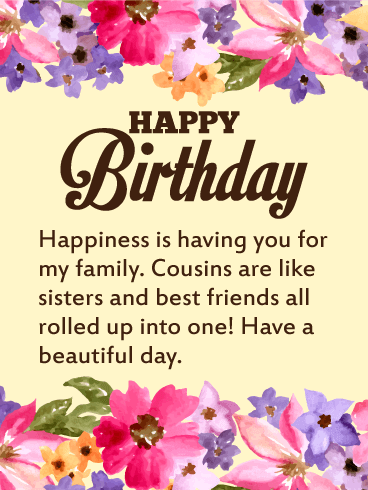 It will let your cousin know that you feel they are special and that you hope their birthday is filled with all they hold dear. 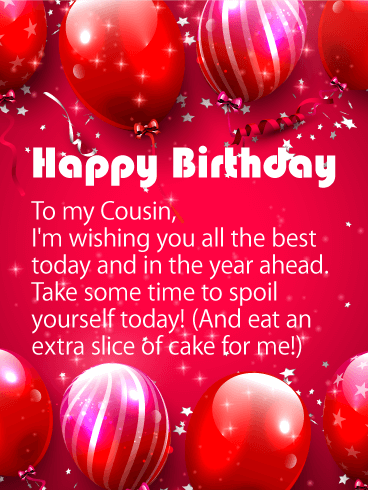 It's a thoughtful birthday message that will show your cousin that you care. Kittens playing with balls of yarn, it doesn't get any better than this when it comes to fun times! 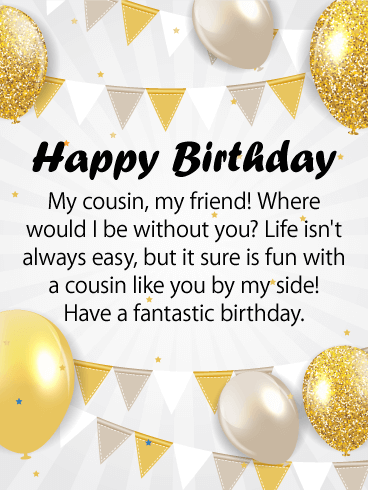 This birthday card was designed for your fun cousin, and they will appreciate that you are wishing them a fun-filled birthday! It also wishes them an exceptionally awesome year. It's a positive birthday card that your cousin will really enjoy. Let these little kittens meet your cousin on his or her birthday so they can start the celebration! 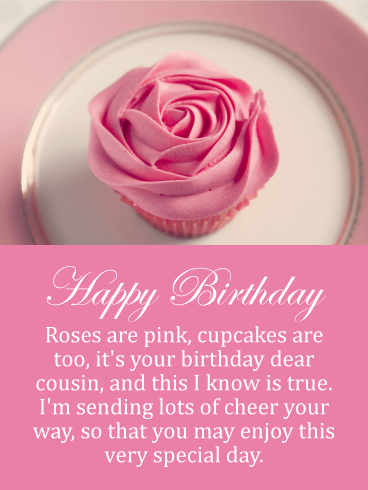 This birthday card not only features the most beautiful fancy flower cupcakes, it also showcases a thoughtful message that will touch your cousin’s heart. The cupcakes were carefully crafted with pink frosting and a delicate rose sitting atop each one. Special care was taken to create these sweets so that you can present them to your cousin. This birthday card will also let your cousin know that you loved spending time with them and you still do. 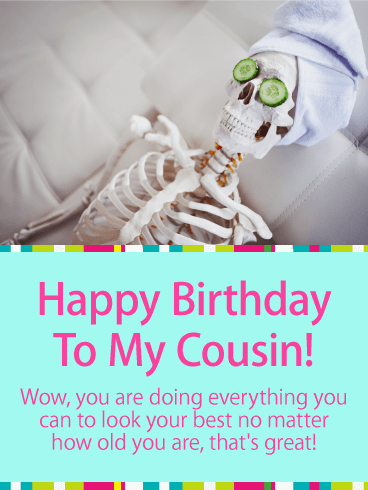 Some cousins are super fun and can be an inspiration to the whole family, and this birthday card captures this personality type. This super fun birthday card features 3 young women riding in the sky on a rocket. So unique and adventurous! It represents trying new things in life, having a blast and lots of fun. So let your cousin know you appreciate the type of person they are with this awesome and creative birthday card! This birthday card showcases wonderful fireworks bursting in the night sky in celebration of your cousin's big day! It will show him or her just how very important their birthday is because there really is no bigger celebration icon then fireworks! 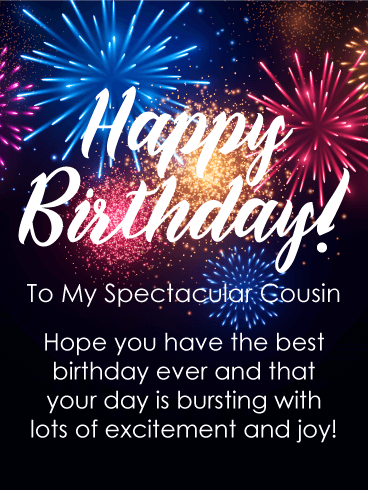 Using this greeting card to wish your cousin a happy birthday, along with a day of excitement and joy, will have your cousin looking forward to the festivities of the day! Nothing is more special than a kitty sending a high five for someone's birthday! That's why getting this cute birthday card over to your cousin for their big day would be a wonderful idea! The message will make your cousin smile as they read how important they are to you. 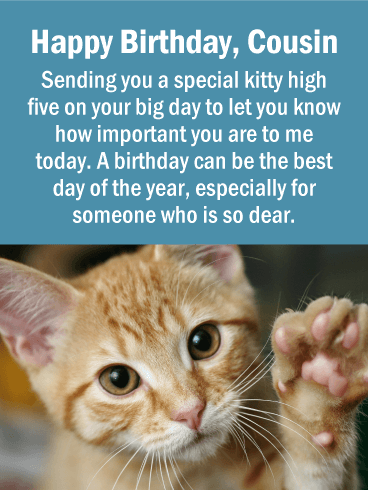 This kitty is eager to complete his birthday high five, so send this birthday card out today to get your cousin’s day started in the best way. Brilliant, confident, classy. 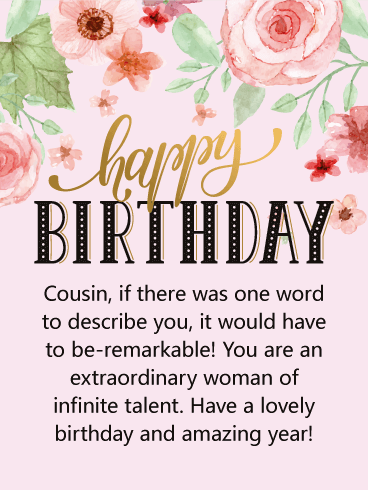 Your cousin is one amazing woman, so make sure to tell her on her birthday! 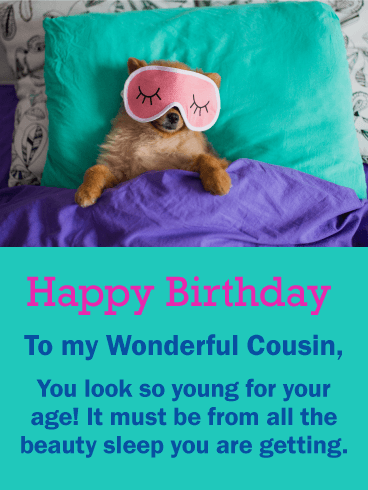 This gorgeous birthday card is a fun way to celebrate your cousin's birthday this year. Send a birthday greeting card with an empowering message that will make her feel beautiful and loved. Every birthday needs a little more glitter in it, so go ahead send this glitzy and fun greeting card today. Some cousins are just charming beyond words. This pretty birthday card for a cousin is too sweet to miss. Send it today to make your cousin's heart glow. Sometimes it's hard to find the right words to say, but it's easy with this empowering and kind birthday card. Celebrate the amazing and remarkable woman that is your cousin! Send her this delightful birthday greeting card today. A cousin is a joy to the soul. One part family, one part friend-cousins are the ones we share secrets and adventures with. 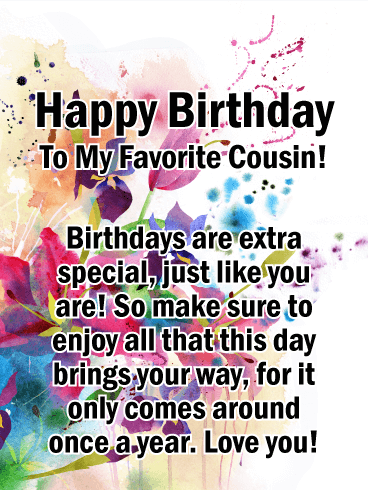 Send this beautiful birthday greeting card to your cousin today as a special surprise. Bright and sunny daisies send warm wishes for a happy birthday to a dear cousin. Some people just know how to make you smile! Sending a birthday card to a sweet cousin is a lovely way to celebrate her special day. Wild and free-the way cousins should always be! Wish a crazy-beautiful birthday to your cousin. You and your cousin have been on too many adventures to count. 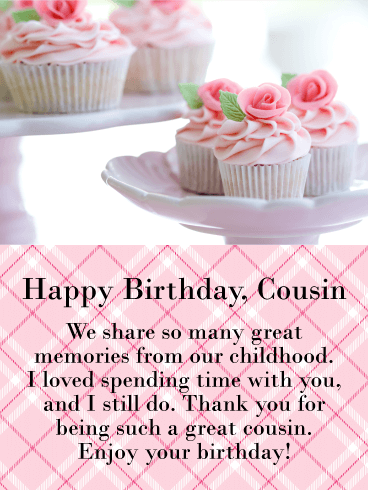 Celebrate your cousin's birthday with a pretty card and sweet message to remind her of all the good times you've had. This fun, tulip birthday card for a cousin is a beautiful and exuberant way to wish the happiest of birthdays to a special woman. Life is more fun with an amazing cousin by your side! Does your cousin shimmer and shine? Does she keep your laughing through good times and bad? 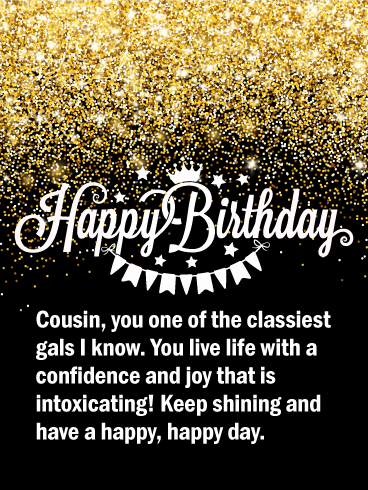 Send a glitzy birthday card to your cousin today and wish her a fantastic day. 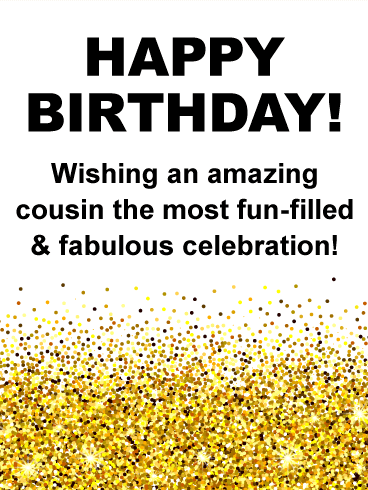 Bring on the birthday fun with this glittery birthday greeting card for cousin with a heartfelt message. It's always a good idea to send a birthday card to your cousin! Cousins are like siblings, but often with less of the drama! Send this zesty birthday card to your cousin to celebrate their special day. 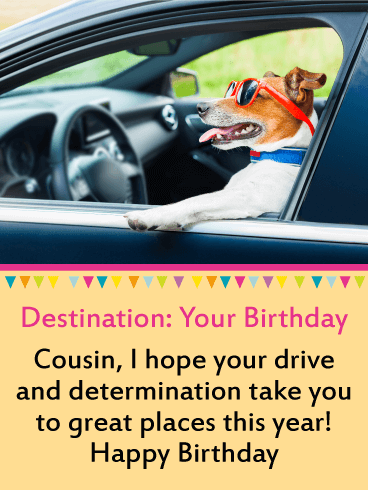 You might to be able to be with your cousin on their birthday, but that’s okay-you can spoil them with a fun birthday greeting card instead! With cousins, the good times always roll! Send this festive birthday card to your awesome cousin today. This fun birthday greeting card for a cousin pops with color and confetti. It's a treat for the eyes and a great surprise if you can't be there in person to celebrate. 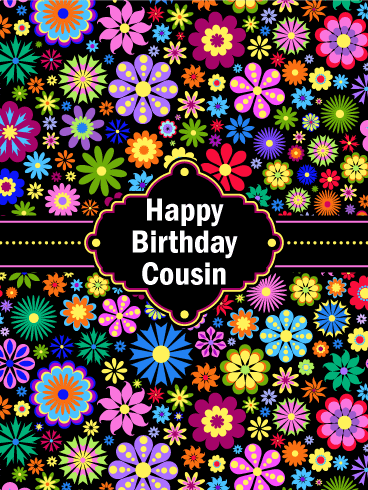 This vibrant birthday card is as festive and fun as your cousin! Send it today for a real birthday treat. Cousins are like sisters and best friends rolled up into one! When you send a beautiful birthday card to your cousin, you send love and joy and fond memories as well. Let your cousin know how dear she is to your heart with this pretty, floral birthday greeting card. Give the gift of thoughtfulness this year on your cousin's birthday with this exquisite birthday greeting card. Shout it from the rooftops! Birthdays are awesome! 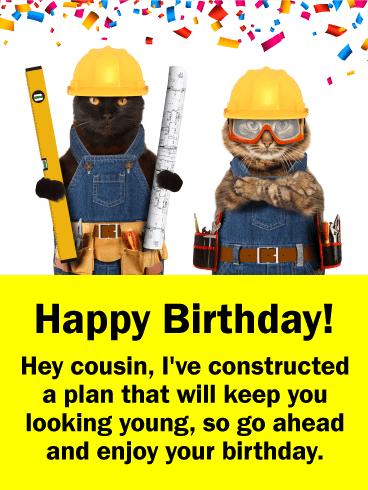 Some people don't like the yearly reminder that they are getting older, so why not send this fun and cheerful birthday card to help your cousin get in the party spirit? There are so many exciting and beautiful possibilities ahead. 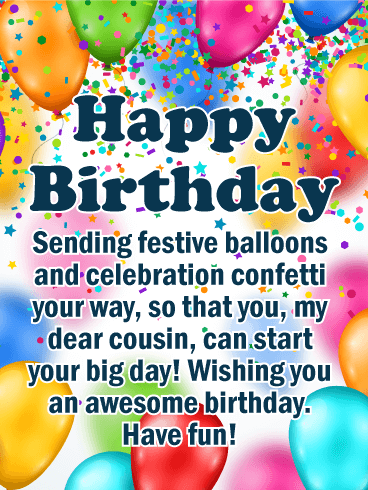 Send this festive birthday message to your cousin today and wish them a wonderful year full of good hope. This special Happy Birthday card will certainly add some joy to your cousin's day. The dog's ears are funny and cute all at the same time. Your cool cousin is going to be very happy that you are his or her biggest fan. With such a fun play on words, how can they not smile after reading it. This birthday card features wonderful birthday colors that really add to the celebration! If your cousin is a lover of fine beer, then he or she will get a kick out of this birthday card! It's a great Happy Birthday card that will certainly give your cousin a laugh or two. It will stand out from all the other birthday cards your cousin will receive. 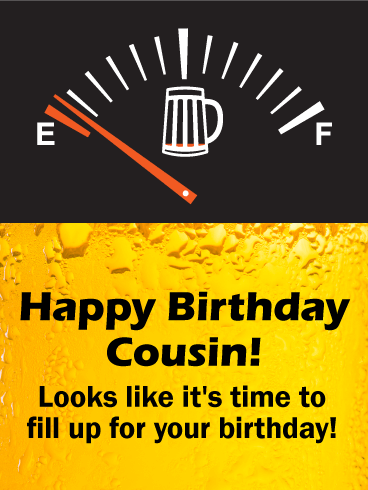 The beer meter is on empty, reminding your cousin that it's time to fill up for their birthday! If your cousin has a great sense of humor, then he or she will think this Happy Birthday card is pretty funny. It's so silly, you have to laugh. The two older people, for some reason, are awkwardly jumping, it certainly makes for a funny image. On another note, the pretty trees with pink flowers look wonderful with the yellow background, adding to the design of this great Happy Birthday card. Your cousin is going to love it! 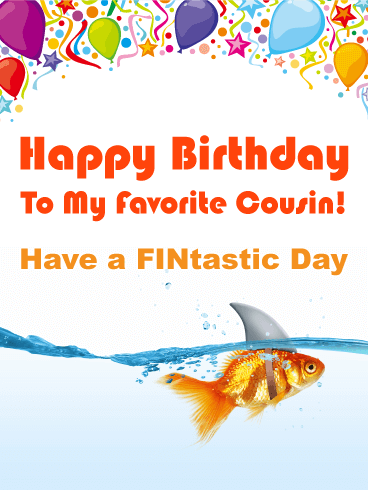 It's time to wish your favorite cousin a FINtastic day with the cute and funny Happy Birthday card. The tiny fish is sporting a shark's fin, making him feel unstoppable today! He wants to wish your cousin the same type of day. The birthday balloons are a great touch and add to the celebration! Send this little guy off to your cousin so he can brighten their day! 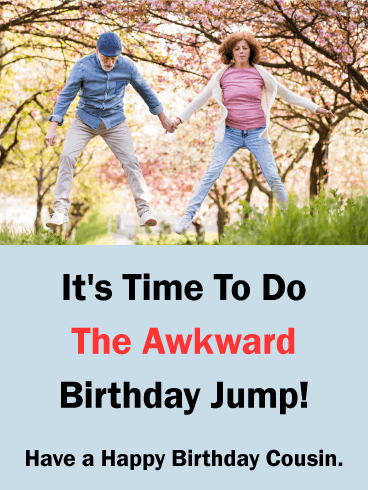 Remind your cousin to have fun and get carried away on his or her birthday! 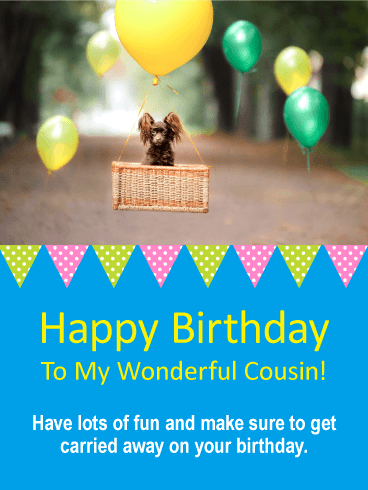 This little puppy is also being carried away, but in a different way, so this Happy Birthday card will certainly give your cousin a little laugh. The bright colors of blue, pink, yellow, and green give this birthday card an element of celebration! Your cousin will be so happy you sent such a cute birthday card their way to help them celebrate their special day. 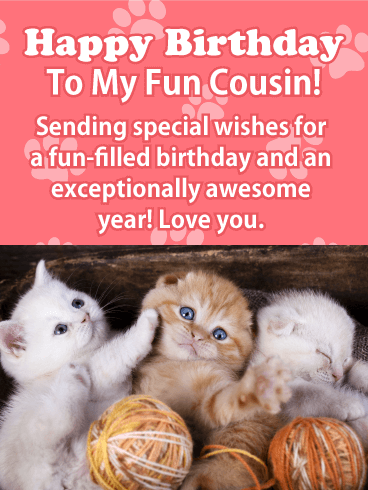 Send this Happy Birthday card to your cousin, it will give them a good laugh! This skeleton person looks like they are at a spa getting beauty treatments. Never give up no matter how old you are is their motto! The bright blue, pink, and green colors make this a happy festive card that will brighten up your cousin's day. So send some fun over to your cousin by getting this beauty queen over to them for their birthday! Want to give your cousin a reason to smile on their birthday, then send this silly Happy Birthday card their way. 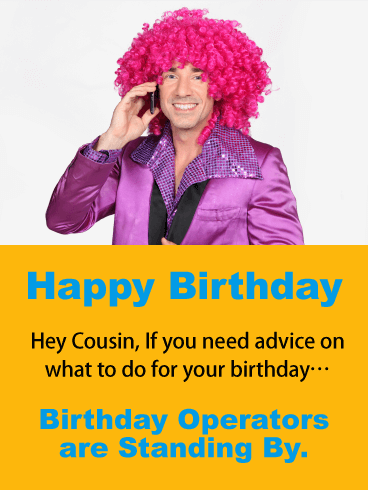 With the words, "Birthday Operators are Standing By", and the image of the supposed funny birthday operator, you will be sure to get a laugh out of your cousin! This birthday card features bright and happy colors, perfect for your cousin's special day! Dogs love to ride in cars but this one takes it to the next level! 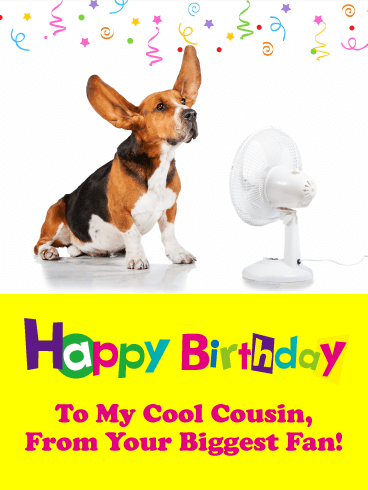 He is excited that he is featured in this cute and humorous Happy Birthday card and he can't wait to meet your cousin! It has an inspiring message that lets your cousin know you are hoping that their drive and determination takes them to great places! It's the perfect message to start their day on a positive note! If you want to give your cousin the best birthday present of all, tell him or her how young they look for their age, you can't top that one! This Happy Birthday card will do the trick, as well as give your cousin a little laugh. The sweet puppy is wearing their sleeping mask, trying to get some beauty sleep. So cute! The eyes painted on the mask are pretty funny and will certainly make your cousin's day. If you and your cousin like to joke around with each other, then this Happy Birthday card would be perfect! 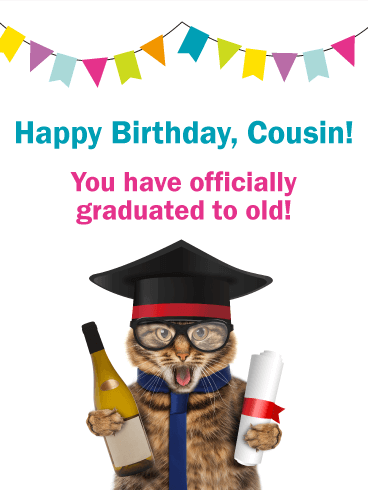 It pokes fun at your cousin in a cute way, complete with a graduating cat who is ready to celebrate. The festive birthday steamer will remind your cousin that this is going to be a great day! This cat is ready to make his joke, so send him on his way to give your cousin a good laugh today! 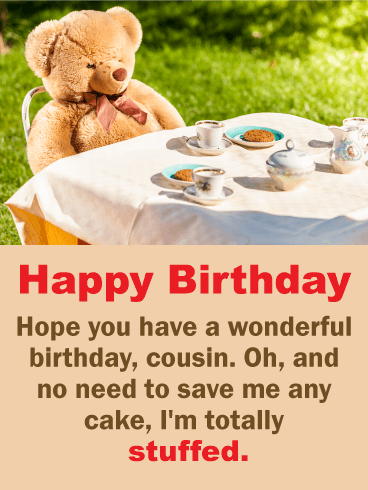 Send some light humor to your cousin on his or her birthday with this fun Happy Birthday card. It will give them a little laugh on their big day. The woman asks what her friend received for her birthday only to get the unexpected answer of, "Older". 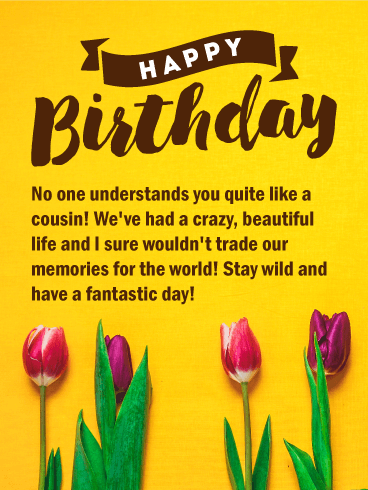 This Happy Birthday card will start your cousin's day off to a good start and remind him or her of how thoughtful you were to remember their birthday. 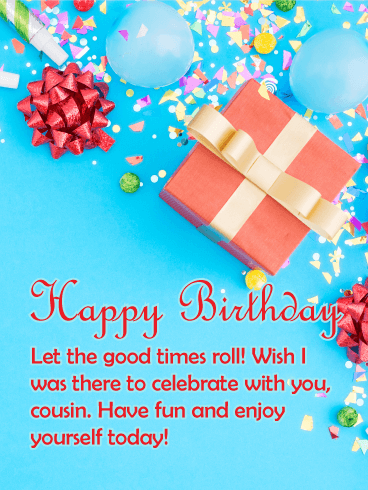 This awesome Happy Birthday card will remind your cousin that a birthday is a time to go out and celebrate and have some fun! The birthday message and image match up perfectly and will give your cousin a laugh or two. So send this specially designed birthday card over to your cousin to get them revved up about their birthday! 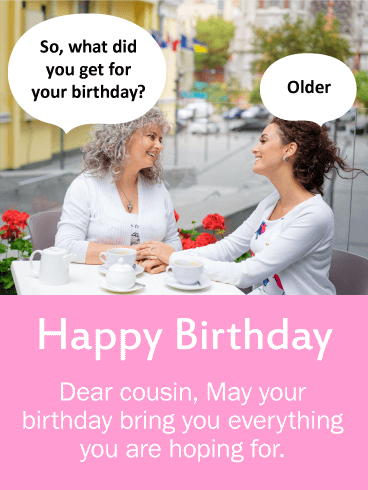 Wish your cousin a Happy Birthday and give them a little laugh at the same time with this funny birthday card that features a play on words. The stuffed animal is stating that he has no room for cake because he is stuffed, get it! This bear thought it was pretty funny. 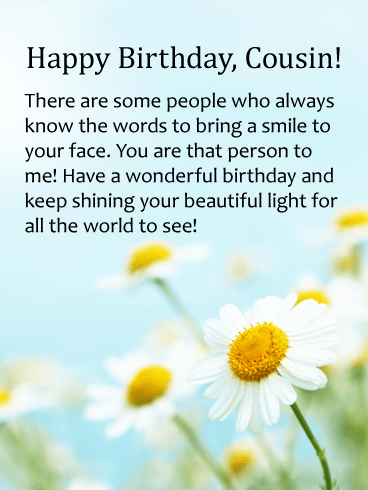 It will surely brighten up your cousin's birthday and make them realize you care because you took the time to send them such a great birthday card.